Photo courtesy of the Penobscot River Restoration Trust. The Penobscot River is New England’s second largest river, draining nearly one-third of the State of Maine with a watershed area of 8,570 square miles. 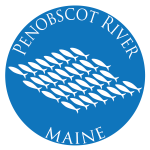 The Penobscot River is used as a spawning or nursery area by 11 migratory fish species, including three listed under the Endangered Species Act. The river hosts the largest run of Atlantic salmon left in the United States. Historically, fisheries on the Penobscot River were bountiful, with an estimated 14 to 20 million alewives, 75,000 to 100,000 Atlantic salmon, and 3 to 5 million American shad. The largely forested Penobscot River watershed has a rich cultural history of commercial, recreational, and subsistence fishing. It is home to the Penobscot Indian Nation, which still occupies part of its ancestral homeland on Indian Island, surrounded by Penobscot waters. Over the centuries, human activities have caused adverse impacts to the watershed. Dams, culverts, water pollution, and overfishing have contributed to an almost complete elimination of many sea-run, migratory fish species and their habitats. With fewer alewife and blueback herring, important commercial species like cod have lost a key food source. This has also affected tribal subsistence fishing and the historically large recreational fishery for Atlantic salmon. Degraded water quality has led to a loss of bottom-dwelling communities, restrictions on fish consumption, and overgrowth of algae. All of this has diminished the watershed’s ability to recover from the effects of climate change, such as warming water temperatures and the potential increase in flooding. Restore multiple migratory fish species including river herring and rainbow smelt. Recover endangered and threatened species including Atlantic salmon, Atlantic sturgeon, and shortnose sturgeon. Improve the prey base for multiple offshore species including Gulf of Maine groundfish to support recreational, commercial, and subsistence fishing. Increase the quantity and quality of accessible habitat in the watershed. NOAA and partners are committed to better managing the Penobscot River ecosystem and recovery of threatened and endangered fish populations. Our partners in restoration include The Nature Conservancy, Penobscot River Restoration Trust, Penobscot Indian Nation, Atlantic Salmon Federation, U.S. Fish and Wildlife Service, Maine Sea Grant, Natural Resources Conservation Service, and Maine Department of Marine Resources. Conducting pre- and post-monitoring of restoration projects to look at ecological results—to assess impacts on fisheries, water quality, and changes in water surface elevations.